Cornelius David "C. D." Toews: teacher, choral director and minister; born 19 March 1900 in Platovka, Orenburg, Russia to David and Agatha (Klassen) Toews. He was the ninth child in a family of two daughters and ten sons. On 22 October 1922 he married Anna Janzen (30 June 1901, Karaguj, Orenburg, Russia to Jacob and Aganetha (Reimer) Janzen - 9 January 1966, Abbotsford, British Columbia, Canada). They had three sons and three daughters. 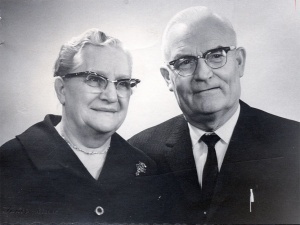 In 1967 he married Anna (Neufeld) Peters, a dear friend, who shared the last few years of his life with him. "C. D." as he was affectionately known, died 29 December 1970 in Abbotsford, BC after living with heart disease for 10 years. On 3 July 1926 Cornelius and Anna Toews arrived in Quebec City, Canada and traveled to southern Manitoba to work on a farm. In January 1927 they moved to Gretna where he enrolled in the Mennonite Collegiate Institute to learn the English language. In 1929 Toews attended the Winnipeg Normal School and was hired to teach in a rural school near Niverville. The Niverville Mennonite Brethren Church ordained him to the ministry on 12 July 1936. He accepted a teaching position in the Niverville Public School in 1937. In 1943 the Mennonite Central Committee invited Toews to move to Yarrow, BC to serve as chaplain to the conscientious objectors working in the BC Forest Service Camps. The following year he taught at the Yarrow Bible School and then transferred to the Sharon Mennonite Collegiate Institute in 1945. When the Sharon Mennonite Collegiate Institute closed its doors in 1949 he was hired to teach in the Chilliwack Junior Secondary School. Toews taught at the Mennonite Educational Institute from 1950 to 1961 while also assisting in the Mennonite Brethren Bible Institute music program in Clearbrook. The family moved to Abbotsford in 1954 where he directed the South Abbotsford Mennonite Brethren Church choir. C.D. Toews then accepted an assignment with the Mennonite Central Committee in 1961 to work in Frankfurt, Germany for two years spending the winters in Switzerland teaching at the Bienenberg Bible School. In 1963 he accepted a position in Heidelberg to work for MB Missions for one year. C. D. Toews returned to BC to accept the pastorate of East Aldergrove Mennonite Brethren Church, where he served for four years before retirement. C.D. Toews was a student all his life. Although he never attained a formal academic degree, he pursued learning in a wide variety of venues. He attended the village school as a child and in his teens he took music lessons, which he paid for by foraging for feed for his teacher’s horse. Toews obtained a teaching certificate and taught in a village school in Orenburg. He had a facility with languages and learned English in two years to qualify for the Winnipeg Normal School entrance requirements. Later he attended summer courses at Tabor College, Kansas, at the Department of Education in Victoria and at the University of British Columbia. Anna, his wife for forty-four years, was hard working and supportive throughout her life. She scrubbed floors in commercial establishments in downtown Winnipeg to support them during Cornelius’ attendance at Normal School. She maintained the household when he was off on extended ventures of study, preaching ministry, music ministry and other related responsibilities. She accompanied him on pastoral visits and maintained a strong prayer support for him throughout his ministry. While extensively involved in teaching and preaching, Toews’ major contribution was made in his music ministry in church and schools. He began as a teenager, directing a Youth Choir in his home MB Church in Orenburg. In 1937 he was appointed choir director of the Niverville MB Church, where he served until 1943. He organized extensive music programs in the Sharon Mennonite Collegiate Institute, Mennonite Educational Institute, Yarrow Bible School and Columbia Bible Institute. The Canadian Broadcasting Corporation recognized his work in the Parade of Choirs broadcasts. He also conducted the sanctuary choir in the South Abbotsford MB church for several years. In addition to these contributions, Toews was extensively involved in both local and national Mennonite music committee work. He served in both membership and leadership positions. Cornelius D. Toews was known for his love of people, love of music and love of church, but mostly for his love of God. He dedicated his entire life to bringing joy to people with the sound of sacred and secular choral music. “The Genealogy of the Peter Janzen Family.” Compiled data from 1770-(unpublished). Mennonite Brethren Herald (5 February 1971): 30. Toews, C. D. Personal Diaries. Toews, C. B. (Neil). “A Brief History of the Toews Family.” (unpublished). Toews, C. B. "Neil". "Toews, Cornelius D. (1900-1970)." Global Anabaptist Mennonite Encyclopedia Online. September 2004. Web. 18 Apr 2019. http://gameo.org/index.php?title=Toews,_Cornelius_D._(1900-1970)&oldid=143024. Toews, C. B. "Neil". (September 2004). Toews, Cornelius D. (1900-1970). Global Anabaptist Mennonite Encyclopedia Online. Retrieved 18 April 2019, from http://gameo.org/index.php?title=Toews,_Cornelius_D._(1900-1970)&oldid=143024. This page was last modified on 8 January 2017, at 17:37.